Setup Tutorial With Cosmos DB: What Sets It Apart? Over the past few years, the NoSQL database market has greatly matured, and NoSQL product offerings should be under consideration when designing a new solution. The relational database is still useful for most projects, but NoSQL offers some excellent options for scalability, performance, and simplicity that are difficult to address with traditional relational databases. It can be setup and configured in a few minutes using only a web browser. It can take advantage of the large, global network of Azure datacenters to provide a globally available data source that is automatically synchronized between datacenters in near real time. There is support to adjust “consistency” levels, so developers have control over consistency versus performance. 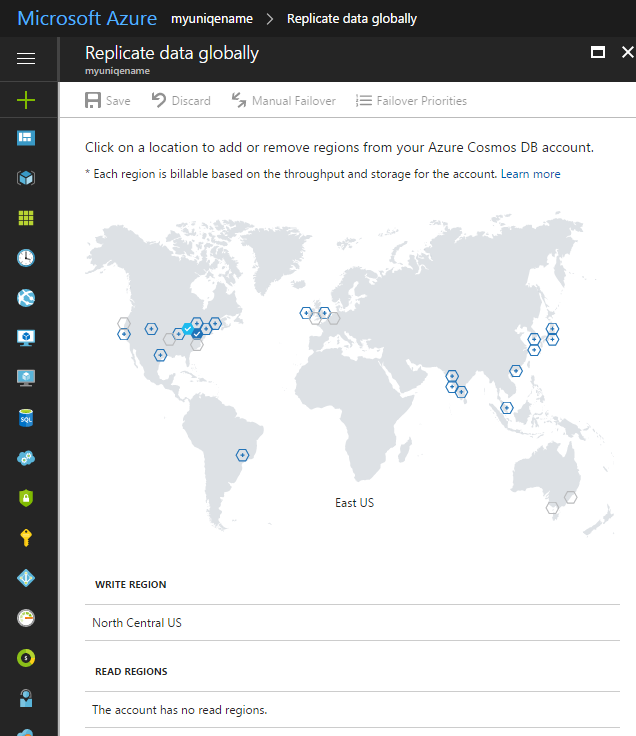 Below is a quick walkthrough of setting up a new Cosmos DB and performing some traditional CRUD (Create/Read/Update/Delete) operations using .NET. This walkthrough is a “Hello World” style demo which shows a very basic setup. This sample includes a simple “order management” data model, which consists of a parent HardwareOrder object that contains a list of LineItems that are owned by the HardwareOrder. The HardwareOrder is also marked with Customer information and relevant dates. This was created using two simple .NET classes that are JSON serializable with Newtonsoft. There is no other schema definition required within Cosmos DB itself. The schema is inferred from the documents that are stored. 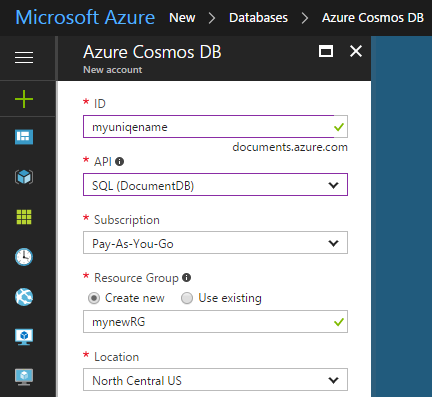 Step 2: Using Azure, create a Cosmos DB instance configured for DocumentDB API, and record connection information. Once the Cosmos DB environment has finished provisioning, review the Overview page for the new instance. Note the Region Configuration. To enable geographic replication, check off additional datacenters on the map. This provides a simple way to setup the incredibly powerful functionality of replication between datacenters. 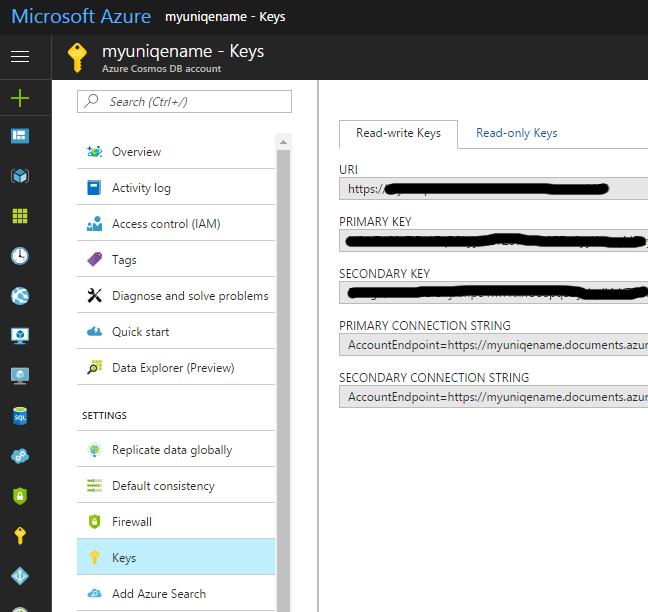 Now go to the Keys section and record the URI and Primary Key for the database. These will be used later to connect to the Cosmos DB through the API. Create a new .NET solution and project. This should be a console application or some other type of application that will start a new process. In this case, a console application is used. 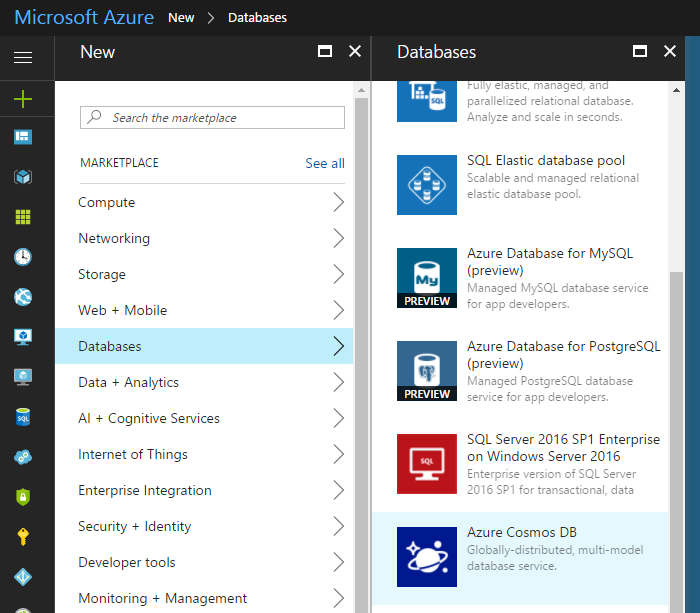 Once the application is created, add a NuGet package reference for Microsoft.Azure.DocumentDB. This will provide a library that makes it easy to write code to interact with data using LINQ or SQL. 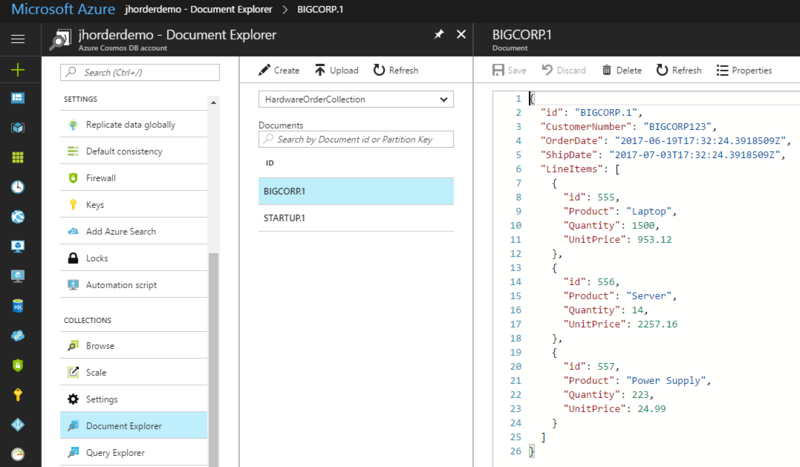 Now, add code to call into the DocumentClient class. This class is the main point of connectivity to Cosmos DB. It helps by forming service calls to the API from C# LINQ statements or SQL text. Note the two query methods – QueryWithLinq and QueryWithSql. These both allow .NET developers to use Cosmos with familiar approaches. Using the OrderManager class, the following code can be used in a console application to create two test HardwareOrder documents in a new collection. The code is smart enough to create the database and collection if necessary. Run the Project from Visual Studio after adding this code. 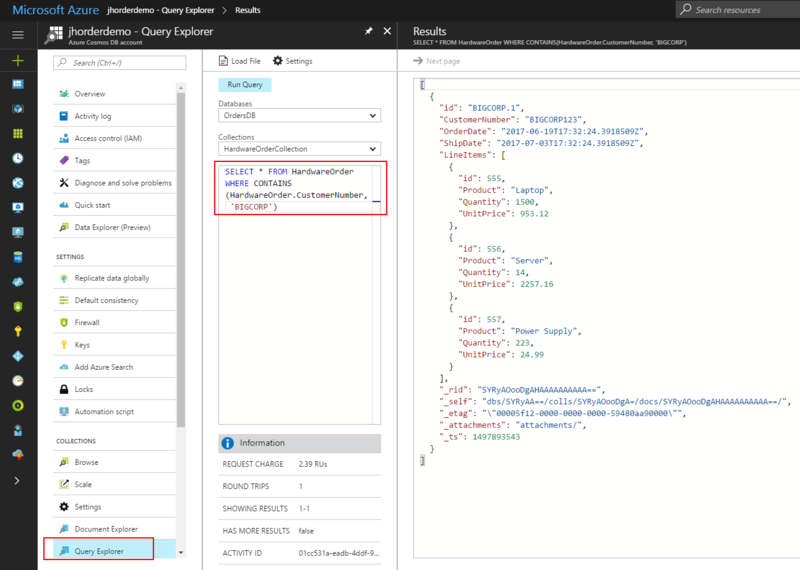 Now that two documents have been created, the Azure portal can be used to view the data, and even run some test queries using SQL. Navigate to the Document Explorer, and two JSON files should be listed. Selecting one of the files will show its contents. The Query Explorer allows a user to execute a sample SQL query against a given collection. Below is an example of an SQL statement that will find orders with the text “BIGCORP” in the CustomerNumber property. The NoSQL tool sets are maturing, and they allow for scalability and performance in areas where traditional relational databases have struggled in the past. The latest generation of cloud-based NoSQL tools, such as Cosmos DB, allow developers to get started with a minimal amount of setup time. Aside from the power NoSQL API, Cosmos DB also supports near real-time geographic synchronization with a few mouse clicks. 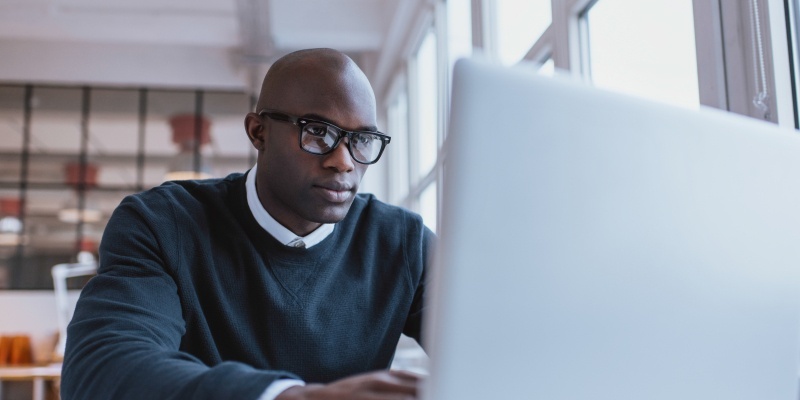 The support for SQL in the API can ease the learning curve for traditional relational database developers.